The roots of some Tolkien’s characters. I have many hobbies and one of them is reading. I like to read. Books liberalize us, and it is just very interesting. My favorite kinds of literature are fantasy, science fiction, myths and historical books. But when I saw the film “The Lord Of The Rings” for the first time, I liked it very much. I realized that there was something unusual in it that attracted me. One day someone told me, that this film is a screen version of the book, written by Tolkien. Then I decided to read the book. And when I read its last page, I realized, that the world, that was described there is very close to me. That is how my keening of Tolkien’s works started. 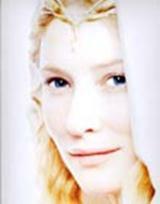 I’ve read the whole “The Lord Of The Rings”, “The Silmarillion”, “The Hobbit Or There And Back Again”, some Tolkien’s poems, such as “Namarie” (which means “farewell” in the “Quenya Lambe” (The Elvish Language)), “Oh, queen beyond the western sees…” and other works. Besides I’ve read “The Biography Of J.R.R.Tolkien”, written by H. Carpenter and many works of different famous critics devoted to Tolkien. While reading such literature, I understand and realize very interesting ideas of Tolkien, his philosophy, and it is very interesting to know, what things influenced the creation of his characters and his own world that he developed in “The Silmarillion”. And in my work I’m trying to show you just some of those things. 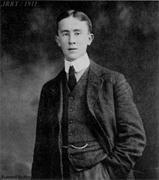 John Ronald Reuel Tolkien was born to Mabel Suffield and Arthur Tolkien in South Africa on January 3, 1892. On February 17,1894, Mabel gave birth to Hilary Arthur Reuel Tolkien, J.R.R's only brother. When Ronald (J.R.R)'s health worsened in 1895, the Tolkiens (except for Arthur, who had to stay in order to wrap up business) left to Southampton. On February 15, 1896, Arthur Tolkien, in South Africa, died due to a severe hemorrhage. Since his father (the sole source of money) was dead, J.R.R. and his family went to live with the Suffields (his maternal grandparents). In the summer of 1896, the Tolkiens moved out of Birmingham to the hamlet of Sarehole (located in the English countryside). "Mabel soon began to educate her sons, and they could have had no better teacher - nor she an apter pupil than Ronald, who could read by the time he was four and had soon learnt to write proficiently." (Carpenter 21). ". . . his favorite lessons were those that concerned languages. Early in his Sarehole days, his mother introduced him to the rudiments of Latin, and this delighted him. He was just as interested in the sounds of the words as their meanings, and she began to realize that he had a special aptitude for language. (Carpenter 22). In September of 1900, J.R.R. 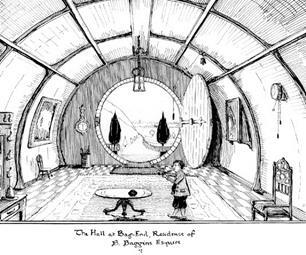 Tolkien entered into King Edward's School. In order to prevent Ronald from walking several miles between the countryside home and school, the Tolkiens moved from Sarehole to Birmingham. 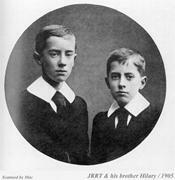 Due to school conflicts, Ronald Tolkien was transferred to King Phillip's Academy for a short period. Related to philosophy of THE LORD OF THE RINGS: Middle-Earth is never, ever free from evil. The Simillirion states that Middle-Earth is destroyed and all live in Valinor (quasi Middle-Earth) after the death of Morgroth (by Turin, son of Thor). Tolkien lives with his mother's aunt-in-law (in urban Edgbaston) along with his brother Hillary. "He continued his search for the 'bones' behind all these languages, rummaging in the school library and exploring the remoter shelves of Cornish's bookshop down the road. Eventually he began to find - and to scrape enough money to buy - German books on philology that were 'dry-as-dust' but which could provide the answers to his questions. Philology: 'the love of words'. For that was what motivated him. It was not an arid interest in the scientific principles of language; it was a deep love for the look and sound of words, springing from the days when his mother had given him his first Latin lessons . . . And as a result of this love of words, he had started to invent his own words" (Carpenter 35) Tolkien begins to (at age 14) to create his own languages, namely 'Nevbosh', a language filled with Gothic and Norse words. In 1911 Tolkien entered Exeter College of Oxford. There he started writing (poem 'Wood-sunshine'), modeled after several different authors. 1913 - Tolkien graduates from three-year program with second-class honors and proceeds to study philology in graduate school. 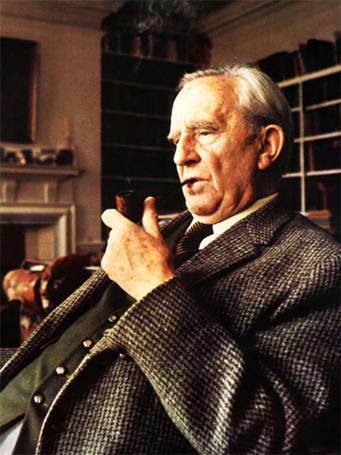 Continuing the last wishes of the T.B.C.S (the society he had founded with his friends at St. Edwards), Tolkien decides to create a whole society. Influences from language: "As to the names of persons and places in 'The Fall of Gondolin' and the other stories in The Silmarillion, they were constructed from Tolkien's invented languages. Since the existence of these languages was a raison d'être for the whole mythology, it is not surprising that he devoted a good deal of attention to the business of making up names from them"
In October of 1920 Tolkien gets second son. 1924 - Tolkien gets a third son Christopher. Sam Gamgee is a hobbit (It tells us many things). He is the best friend of Frodo and besides that, he is Frodo’s gardener. He is very brave, bonhomous, kind, but careless and light-hearted, and, as all hobbits, he likes to eat very much. It is very interesting, that the word “gamgee” can be translated from one of the English dialects as cotton wool and besides that, it was a surname of a doctor, who had invented 'gamgee-tissue', a surgical dressing made from cotton wool. But the real character of Sam was copied from the character of the mere english soldier of the war of 1914. You already now from the biographical sketch that Tolkien took part in that war. He battled on the front line in France. And he knows, what the war is. Later in one of his letters he wrote: “My Sam Gamgee is indeed a reflection of the English soldier, of the privates and batmen I knew in the 1914 war, and recognized as so far superior to myself”. Hobbits is a people of Halflings. They live in holes. They are very short, practical, strait-laced and they like tasty food most of all things in the world. These creatures were created by J.R.R.Tolkien. He was the first, who used them in his books. There are two versions about the origin of the word “hobbit”. V.A. Muravjov keeps one of them. He wrote in his entrance to “The Lord Of The Rings”, that the world “hobbit” is a mixture of latin word “homo”, which means “human” and english word “rabbit”. But Humphrey Carpenter explained the origin of this word in a different way. 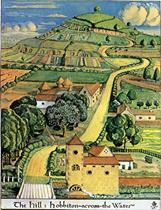 In his “The biography of J.R.R.Tolkien” he wrote, that in his youth Tolkien read the book “Babbit” by Sincler Luis and it influensed him very much. Carpenter shows us the resemblance of the personality of Babbit and Bilbo Baggins, the main character of Tolkien’s book “The hobbit or there and back again”. Tolkien himself told in one of his interview, that his hobbits have no even a hint on rabbits. That is why I can say, that the second version about the origin of the word “hobbit” is more correct. The Shire is a country of hobbits. But it also has its roots. From the biographical sketch we know, that four best years of his childhood Tolkien spent in the village of Sarehole. And wile reading Tolkien’s description of the Shire I realized, that it is very close to the Carpenter’s description of Sarehole. The same water-mill, the same pretty flower-beds, the roads paved with stones of different colors. We can see the festive tree, which was decorated by hobbits every holiday. And we know, that in Sarehole there was a tree, that Tolkien remembered all his life. The first his wise tree. In hobbits-halflings we can see the same efficient, plain and stiff english peasants so much loved by Tolkien. All his life Tolkien loved trees. In his childhood he dreamed, they could have mind, speak to each other and even move. And his dream came true as we can see it in his works (mostly in “The Silmarillion” and “The Lord Of The Rings”). When professor created reasonable trees, he desided to creat someone, who will look after them. That is how ents appeared. 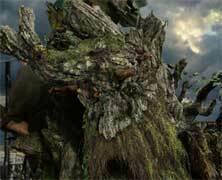 Ents look like trees, but they more reasonable, more movable and of course they are immortal. They are not fidgety, but very wise. Their speech is very slow and calm. Its manner (“Hrum, Hoom”) was copied with the deep bass of Luis, the best friend of J.R.R.Tolkien. The elves in their appearance, whom we can see in the books of Tolkien were also mostly created by him. The roots of these characters are very ramified. Professor read a lot of information about all kinds of elves and finding something general tried to create something new. Finally he got immortal creatures, who can be killed only with a sword or they can pine away to death. They are tall, have perfect eyesight, bright hair and brave harts. They are wise, because of the memory they keep in their immortal mind. But elves themselves estimate their immortality as end-around infinity of analogical events, which exhaust and oppress them. But they have a dream to return to Valinor, country, where their immortality wont be so hard and difficult. Si loth a galadh lasto din! Let the flower and the tree listen in silence! Beren, the bravest warrior herd this sounds and loved Lutirn in a moment. But he was mortal and she was an elf. That is why they could not be together. But their love was so strong, that Lutien managed to ask the goddess Varda to help them. 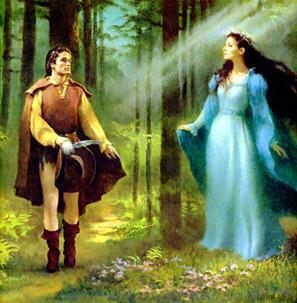 And Varda helped them, so Lutien became mortal and shared the destiny of her sweetheart.